Our team hosted a food and personal care item drive from 6/28/17 – 7/7/2017 at selected MB Financial Bank branches to support Chicago’s Common Pantry. Based on a list provided by Common Pantry, the food drive focused on collecting non-perishable food items such as canned foods, easy prep meals, and condiments along with personal care items such as shampoo, toothpaste and deodorant. Once the food drive concluded, Common Pantry will use the contributions to serve individuals and families from the community they serve in need of food and personal care items. 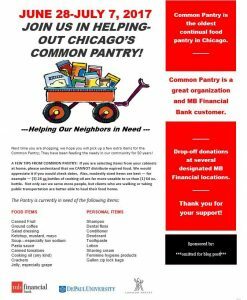 Common Pantry, was founded in 1967 to combat hunger and food insecurity in specific northern neighborhoods of Chicago. 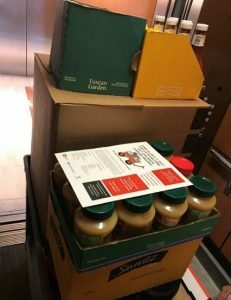 Common Pantry is dedicated to eliminating hunger and food insecurity in our community by providing access to food and by addressing the root causes of poverty. We rely entirely on the generosity of private donors. 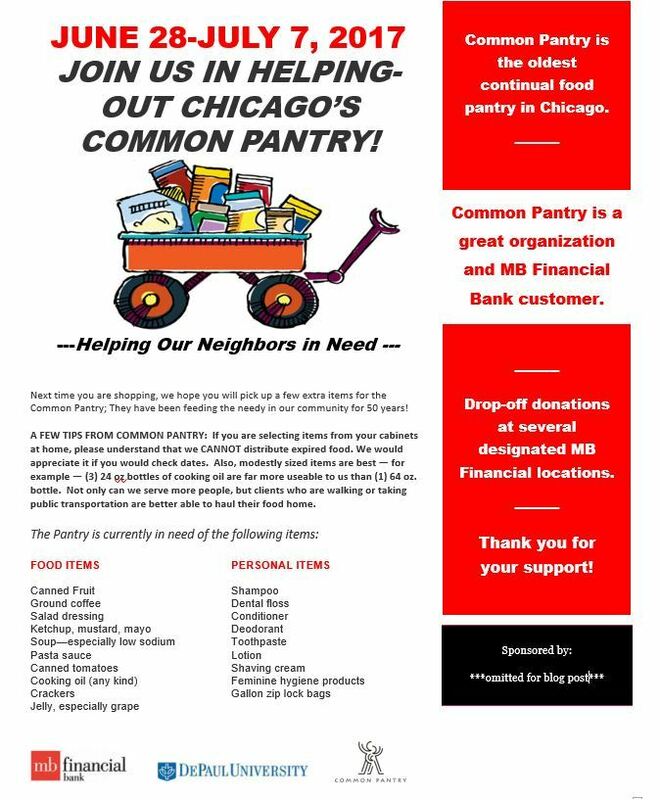 Click on the title of this section for more info on Common Pantry. 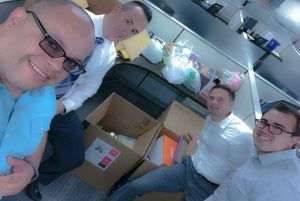 Our main objective was to collect as much food and personal items from the “needs list” of our charity, Chicago’s Common Pantry. We had to determine the logistics and scope of our project to be completed in a feasible time frame given that we had a little less than 5 weeks to complete it from conception to the end. Bring awareness to a great not-for-profit organization that helps the community in which it resides in, the north side of Chicago. 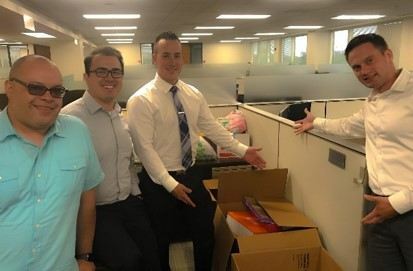 We had 14 points of collection and had a solid turnout at most of those locations resulting in the accumulation of 8 full-sized (large) boxes with an estimated value of $250.00 per box totaling around $2,000.00 in goods for Common Pantry to distribute to families in need. 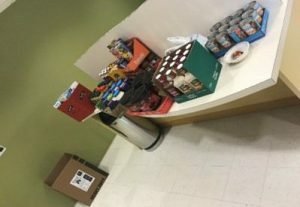 A rough estimate of almost 1,000 items ranging from toothbrushes, deodorant, feminine hygiene products, to pasta, peanut butter, and lots more food and personal care items were collected in the week and a half drive. Large collection boxes get real heavy, real fast! They also need to travel to their final destination once they are filled-up. Try and arrange a pick-up ahead of time from the charity that you are working with. Always remember that this is all for a great cause! COMMUNICATION IS KEY!!! Not only between your teammates, but also your stakeholders and extended help. Thank everyone that helped out, whenever possible.